If you want to get any common and favorite game in a casino, then blackjack will be the first for that. In this game, you have a chance to change the game's result towards you, if you use all the rules of the game and you also used the counting system for having records of already dealt cards. When you play progressive blackjack, then you have to bet $1 extra with each bet and if you win then you will get a fraction of the blackjack jackpot. Like other versions of blackjack, you are not playing against the players; you are playing against dealer or house. Semi-circular table is used to organize the game and 5 players can play at a time. Bets are placed according to the circle. Shoe is used to deal the cards to the players and dealer and 4 decks are used to play this blackjack and each deck will have 52 cards without the jokers. In our online casino, we use progressive blackjack and we follow European rules for the game. Our progressive blackjack has 5 player's positions and when you want to play, you can choose any of those positions. You are also allowed to play all 5 hands at the same time and you have to place bet separately for each hand. Every player will be dealt 2 cards and dealer will also have 2 cards and one card will be faced up another will be faced down and that card is known as hole card of the game. You have to get your hand's point 21 or close to it and a point over dealer's hand to win the game without busting, if you bust you will lose whether dealer busts or not. Dealer has to hit if he has 16 or less points in hand and if the dealer has point over 16 then the dealer must stand. different decks of cards are used to play the game and after every round those cards are shuffled and next round starts. You can hit many times if you want so until you bust and if you get point over 21 then you will bust and you will lose automatically. When the dealer has point 17 or more with a soft or hard hand then dealer must stand and hit if the point is 16 or lower. s, Ks, Qs and Js has the same 10. Ace will have the value 11 or 1 based on situation. If you have cards where if you count ace as 11 and total point does not exceed 21 then that is called soft hand and if you have a hand where total point will exceed 21 if you count the ace as 11 then that called hard hand. If you have a soft hand and you hit another card and then the total point exceed 21 then ace will be counted as 1. 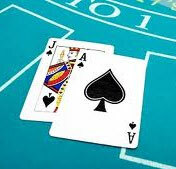 If you have an ace and 10 valued cards then you have the blackjack and you will autometically stand and if the dealer does not have blackjack then you will win and the payout will be 3 to 2.